Recently I had a discussion with a local pastor about their church’s struggle to overcome a growth plateau. This is a very common difficulty for organizations that are aspiring to grow and is especially of concern for many church communities. Funny thing is, I first encountered dealing with plateaus as a budding bodybuilder in 1991. Although there were several “expert” (nonscientific, of course) opinions on how to overcome physical plateaus, there was also a wealth of scientifically valid studies on how to adjust your planning and approach in order to minimize and possibly avoid altogether the risk of “hitting a wall.” As it turns out, there are a lot of parallels I’ve been able to connect throughout my research in strategic people development and leadership principles. Anyway, I asked this pastor several questions to ascertain some foundational issues. I’ll share more about this later in this article but let’s briefly discuss why some churches get stuck against a membership wall. And by the way, there’s always hope if you are seemingly in a rut in regards to church growth, but it may require a good dose of humility and willingness to change directions and invite counsel from others to accomplish it. So let’s explore this idea of church identity further. Many churches operationally mirror businesses or corporations except that they are not usually staffed by people with corporate backgrounds, training and expertise. This has its pros and cons. They may implement business models without the business experience to correctly analyze the results. Oftentimes, large businesses hire consultants and experts to analyze growth trends as well as evaluate current employee productivity and efficiency. Roles are constantly evolving and being redefined so that talented people can (or at least should) focus on their strengths. Unfortunately, churches are usually started and grown with very little executive input, which can lead to burnout, staff turnover and premature baldness (joke) due to stress and confusion. Let’s introduce a companion industry for comparison sake: The Fitness industry. This beloved field is wrought with entrepreneurial exploits built on callings and passions. However, the archaic standards and lack of professional protocols held in place mostly by tradition and disorganized experimentation–not that religion has ever had negative consequences from adherence to tradition and experiential evidence (sarcasm)– have prevented many gym chains from experiencing the kind of revenue and growth seen in other industries. Much like the church industry, you see people passionate about fitness (parallel this with spiritual fervor) who aren’t so great at using excel spreadsheets, managing money wisely and forecasting daily trends. Gyms, much like churches, are geared towards building (and retaining) membership and providing a quality service for the purpose of helping people become physically more fit. Financially speaking, the goal was always to increase revenue and sustain high member retention rates. I was fortunate to have spent most of my career in high-end facilities (member-focused; service-centered; staff-supported leadership) that were extremely adept at successful business practices. However, I have also experienced my fair share of operational mistakes that resulted in high staff turnover rates, low member retention rates, poor employee morale and overall negative environments. One of those tenures involved a large company who hired/fired over a few CEO’s in the relatively short time that I worked for them. After numerous attempts at a concise, consistent and supportable mission statement, they failed to identify exactly who they wanted to be as a company and this created all kinds of company-wide chaos and fickle pursuits of managerial productivity. Their brand may have been well known but internally there was major evidence of corporate identity amnesia. As a leadership coach with many years of experience supporting corporate executives as well as pastoral staff of many denominational backgrounds, I am frequently amazed by the similarities in organizational structures and concomitant difficulties in maintaining successful membership involvement. Passion and devotion to what you believe in (church or work) is great but there are some things I truly believe to be essential to an organization’s success. One of the concepts I preach over and over in my personal training school is the idea of identity–Who do you think you are versus who you were created to be? Change agents have to be skilled in the evaluation, nurturing and fine-tuning of the personal beliefs that their clients/patients maintain. Negative thoughts yield negative actions. Luke 6:45 comes to mind…The good person out of the good treasure of his heart produces good, and the evil person out of his evil treasure produces evil, for out of the abundance of the heart his mouth speaks. Specifically, a preacher or personal trainer can give all the sage advice and beneficial strategies to a person they possibly can. However, a person with self-limiting beliefs will struggle to implement those concepts and practices because they do NOT feel they are worthy of a better life or that their situation is too insurmountable to overcome. [see James Prochaska’s “Stages of Change” model] However, I believe very strongly that anyone can change their circumstances with the right perspective, strategies and support. There’s a saying that you cannot fix what you cannot measure. If you can’t identify what needs tweaking, you run the risk of wasting precious time, resources and volunteer support. This is where it is crucial to establish your organization’s clear purpose for existence as well as how you are going to interact with the community you serve. Let’s examine an illustration for a moment. When a large chain fitness club becomes successful, it’s not uncommon for it to be purchased by a holding company. This usually means that employees of the holding company are inserted into or consult with the current executive team of the gym business. The goal: produce more revenue…and maybe create a better product or service while they’re at it. This sounds great on many levels but unfortunately the emphasis on greater revenue production can put the original vision or identity of the purchased company on the backburner. Similarly, when churches decide to build a new facility to aid in member growth and ministry effectiveness, they can lose sight of the original purpose, strengths or vision of the church. It is imperative that an organization develops and purposefully maintains a lucid understanding of what they strive to be. 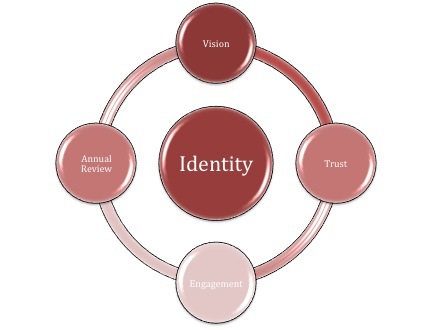 In addition, the language they use to define and support this identity have to point all individuals involved with this organization towards the growth of their vision. On October 12, 1975 in the Willow Creek Theatre in Palatine, IL, Bill and friends launched the very first Willow Creek church service. The church thrived, quickly outgrowing their space at the theatre. In 1977, they purchased a plot of land in South Barrington, IL—the site of the central church campus today—and construction began. In February 1981, the fledgling church met for the first time in its new home. God has taken Willow on quite a ride since those early days. And throughout the past 35-plus years, Bill and the Elders and leaders of Willow Creek have never lost sight of that original vision of being an Acts 2 church. While much has changed over the years, key themes—taken straight from the Acts 2 passage that gripped Bill’s heart in 1972—have transcended individual leaders, ministries, and eras. These themes are part of Willow’s very DNA as a church. And the church’s mission, to turn irreligious people into fully devoted followers of Jesus Christ, remains its singular passion. Today, more than 20,000 people worship at one of Willow Creek’s six regional campuses each weekend. Churches from around the world look to see what God is up to at Willow, and to find encouragement and equipping for their own ministries. Willow Creek remains, above all else, a local church of Christ followers—a place where people matter to God and to us, where together we seek to live out God’s vision of being an Acts 2 church. Now, when I read Acts 2, I see an extremely single-minded, unified group of people who not only walked for three years with the real “most amazing man in the world” (apologies to Dos Equis), but also an expectant group of hungry individuals—lucid vision in tow–who had spent 40 days learning about a Kingdom where God was going to add his “Super” to their “Natural” and God Himself was going to insert His Spirit and subsequently empower every individual (and their children’s children) to set the world on spiritual fire. The Holy Spirit was not going to railroad the “human organization” He was entering in this new partnership…He was going to join, love and empower the partner–male, female, jew or greek–to change the world for His Glory. In terms of Willow Creek’s initial goal of being an Acts 2 church, it seemed, however, that an alternative vision was being emphasized: The development of numerous programs aimed at inviting members to get “more involved” which would then facilitate their spiritual growth and cause them to become a “fully devoted follower of Christ”. Willow Creek became a beacon for many churches to emulate because they were turning their experiences in explosive church growth into reproducible formulas and seminar events. I don’t think Jesus had lots of church activities in mind when he was heading towards the cross. Personally, I believe He had intentional and focused discipleship on His mind. Willow Creek’s Reveal Study and subsequent follow-ups conveyed this very idea so it’s no secret that churches who focus too heavily on church activity involvement find it difficult to advance spiritual formation. Churches need an unbiased approach to evaluating member spiritual health in addition to feedback on church efficiency. Far too often, church leadership (which may just be a single pastor) takes “constructive” criticism personally and thus prevents leadership from doing in-depth reviews of church administration. This was just one large example of an approach to help churches find ways to combat ineffective ministry practices. So what can churches do to grow? Earlier I mentioned the conversation that I had with a local church pastor. They had recently evaluated that they were stabilizing (slowing way down) after an initial surge of memberships due to a recent building purchase a few years prior, which had much higher traffic and exposure as well as a beautiful exterior design. – What is your church’s mission? – What is your church’s passion? – Where do you see your church in 10 years? – How does your leadership seek counsel from outside influences? – How open is your leadership to “feedback”? – What would you change overnight? – Any acknowledged weaknesses that your leadership is embracing? Again, this is a very common characteristic for churches to experience growth after a building upgrade. Oftentimes, It can create a false sense that internal design and practices are very effective when in reality you are simply experiencing a spurt of people taste-testing the spiritual environment. To compound the problem, there’s nothing worse than an organization that rapidly grows when the systems that support the organization are in dire need of revamping and realignment. Primarily because change is very hard for people to accept or implement in large scale, it’s very important that an organization prays long and hard and invites “wise counsel” in the beginning to help shape a vision that is meant to be a foundation for that group. Leadership also needs to designate a team of trusted in-house or external advisors solely dedicated to truly constructive feedback in order to ensure they are focused on the right things and the right people to support. Once it (vision) is in place, perfect what you do and love rather than compare yourself to other churches who seem to be “doing it right”. Bruce Lee once said, “I fear not the man who has practiced 10,000 kicks once, but I fear the man who has practiced one kick 10,000 times.” In other words, what you feel the Lord has called you to bring to the world, Bring With Power…Supernatural Power! This has definitely been the case with my forefathers. My grandfather was a preacher for over 50 years who had a personal vision of loving unconditionally (he had an inner city church and also worked for a children’s home). My great grandfather was also a preacher for over 50 years and he LOVED to teach the bible. My dad is president of an architectural firm in North Dallas who has done numerous design projects for churches in addition to large university buildings. Dad’s job is to help a church clarify it’s vision and values so that the church and its campus can reflect and support the implementation of that vision. 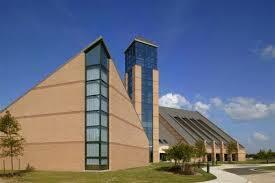 Some of his work can be seen here (as well as the pic to the left of a church design in AggieLand). The key to growth is to multiply what you’re church is gifted at doing by strategic discipleship and empowering leaders to help sustain the efforts of your body of believers. Just make sure that LOVE is the most important thing emanating from your church so that the world will know you are His disciples rather than simply a zealous bunch of religious people telling the world they’re heading to hell in a handbasket. Hopefully I can spend more time with how you unpack the previous questions that a church leadership contends with in a future article. As usual, we are always available for consultation with leaders who are seeking a new infusion of strategy and development. Don’t hesitate to drop a question for us.